The Atlantis Resort on the famous man-made Palm Jumeirah island in Dubai evokes all of the sense of fantasy and adventure that has ever been written about the mystical island. The resort is truly extraordinary to look, and I must confess to being one of the ogling tourists who kept snapping away at it as I approached the hotel on the monorail. But security is tight and it’s difficult to wander around the resort. Therefore other than the exterior structure and the restaurant area there is little for non-hotel guests to see. There are a number of dining options in Atlantis The Palm, one of which is Ronda Locatelli, the Dubai outpost of the famous London-based Michelin-starred Italian chef, Giorgio Locatelli. Unlike Locanda Locatelli, Ronda Locatelli steers away from the high-end fine-dining side of things to focus on something more casual. 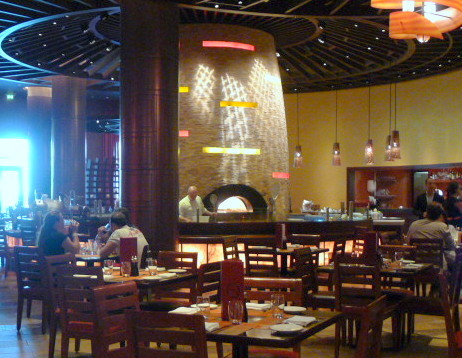 The centrepiece of the restaurant is a large round wood-fired brick pizza oven. It’s an arresting focal point for the restaurant that ensures a relaxed and uncontrived atmosphere, perfect for the many families which no doubt stay at the hotel. The Italian menu is traditional and rustic, with a strong emphasis on pizzas and pastas. But there’s also a good selection of starters, salads and mains with monthly promotional offers thrown in. 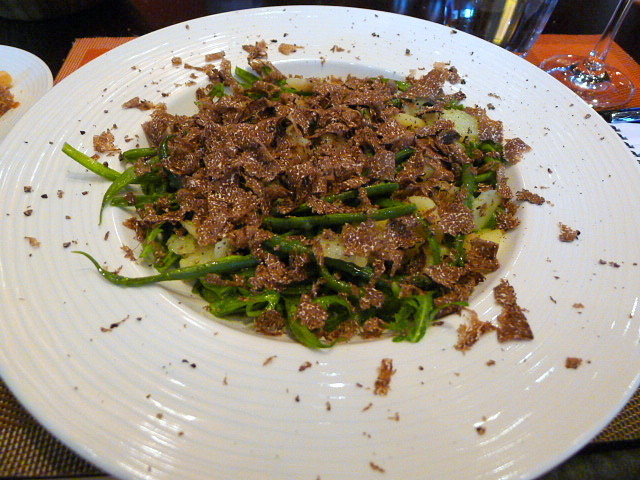 Starting with something light, and a green bean and potato salad with shallot dressing and summer truffle (AED85 – about £14.50) proved simple yet tasty. The shallot dressing was light with a zingy touch to it, and it served to bring all the ingredients together quite well. 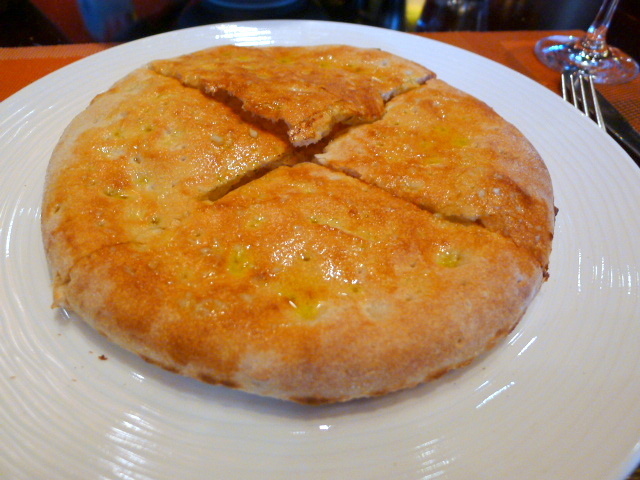 A garlic pizza starter (AED45 – about £7.70) consisted of baked pizza dough drizzled with garlic oil. The dough was good, being crispy on the outside and soft and tasty on the inside. It also smelt fabulous from the garlic, although you didn’t get much flavour from the garlic itself as the garlic oil had been basted on the dough after baking. It therefore tasted more like plain, freshly baked pizza dough than a luscious garlic-flavoured bread. 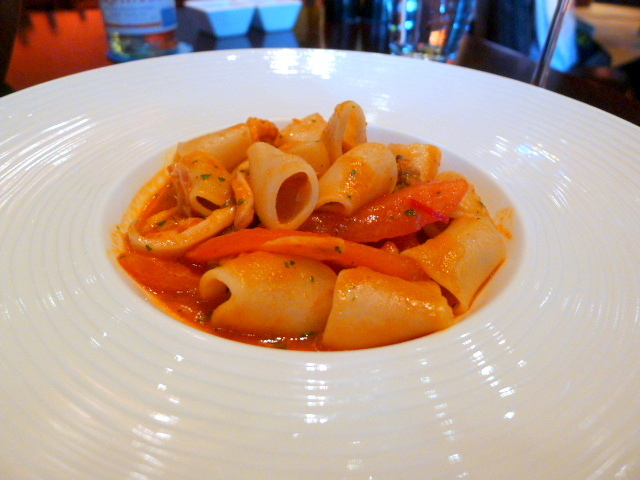 Paccheri pasta with mixed seafood and a chilli, garlic and tomato sauce (AED155 – about £26.40) was excellent. The pasta was al dente and the finely chopped mixture of prawns, mussels and calamari was fresh. The sauce was really tasty with the earthiness of the garlic and the touch of spiciness from the chilli. 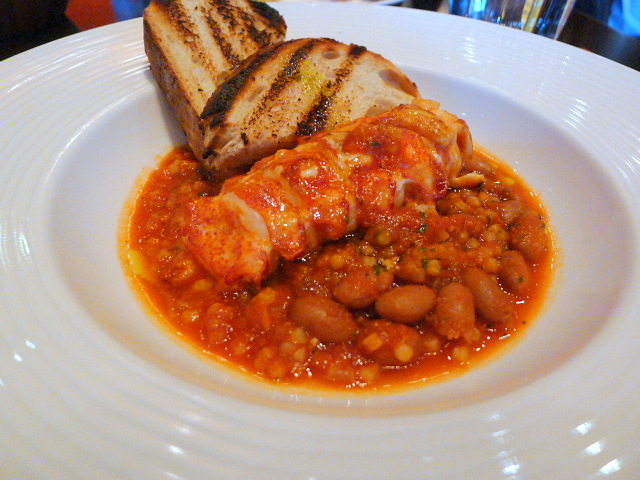 Roasted lobster (AED280 – about £47.60), served with fregola pasta and borlotti beans in tomato sauce, was firm in texture with an excellent flavour. The lobster was very good, and the combination of the fregola and borlotti was wholesome and hearty. But the tomato sauce was quite acidic, leaving a sharp aftertaste on the palate that detracted from the dish. A selection of desserts (AED63 – about £10.70) revealed a delectable plate of petit four sized goodies including fabulous Sicilian cannoli with a crispy pastry and creamy ricotta filling; devilish lemon meringue tarts with the fluffiest of meringues; zingy lemon tarts; beautifully smooth coffee ice cream; gooey chocolate cakes and rich amaretto parfaits. The variety was excellent and they were all well made. There’s something convivial about dining at Ronda Locatelli, especially when you have the fascinating goings-on of the wood-fired oven to lay your eyes on. Although it’s not quite a destination restaurant, it made for a satisfying lunch during my tourist visit to The Atlantis. It’s all comfort food done simply, but done well. 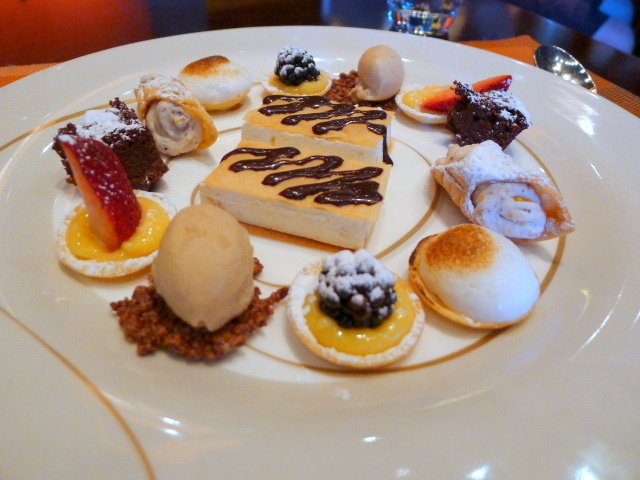 Particularly pleasing were the desserts, which were truly something to sink your teeth into. The service was effective and friendly, but occasionally it was difficult to get the attention of the waiting staff. Prices: AED195 to AED520 (about £33 to £89) for three courses. The average price of a pizza is AED75 (about £13). Includes tax and service but excludes drinks.